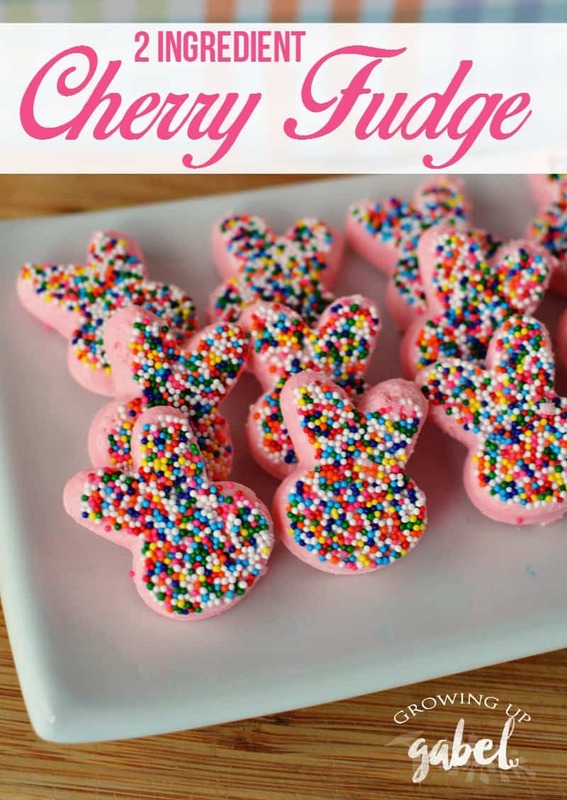 Make cherry fudge with this easy 2 ingredient fudge recipe! 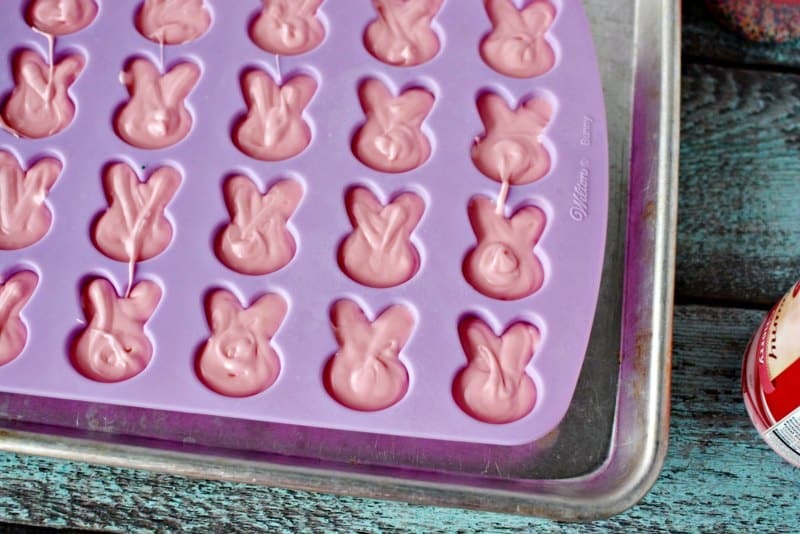 I have this really cute bunny silicone mold that I pull out every spring to make something bunny shaped. 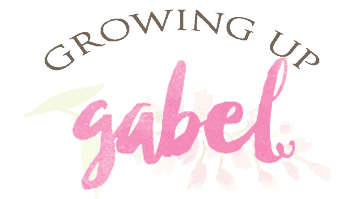 I've used it to make homemade soap in years past. 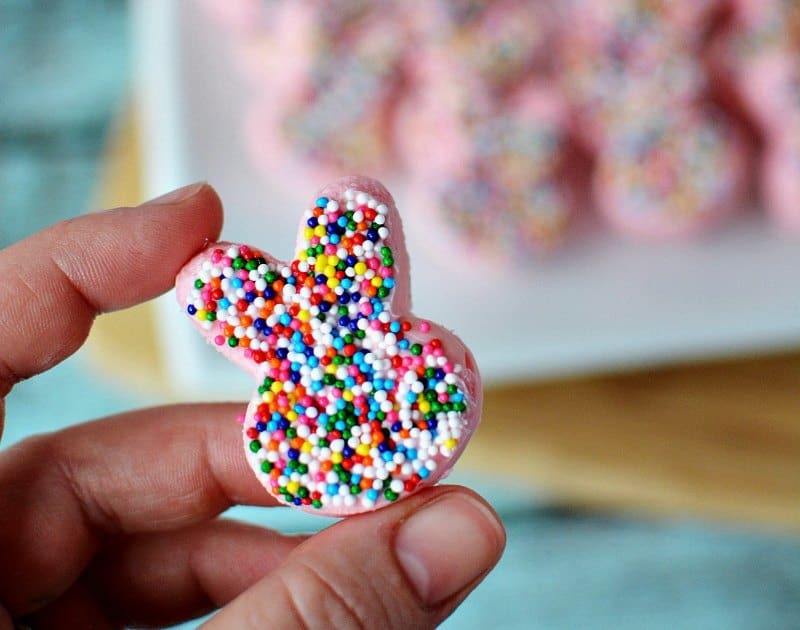 I thought it would be cute to make an easy fudge recipe for Easter brunch. 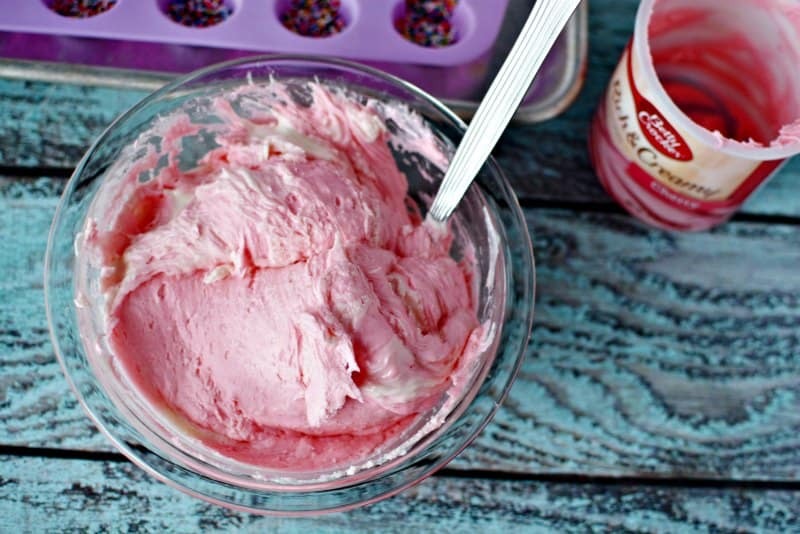 I've seen a 2 ingredient strawberry fudge recipe that uses strawberry frosting to make fudge. It intrigues me! But it seems everyone else had the same idea because strawberry frosting that wasn't whipped or fluffy was not around. And since most recipes I looked at said NOT to use whipped or fluffy frosting, we went with cherry instead. Place your bunny pan onto a baking sheet. Fill each cavity with rainbow sprinkles OR add the sprinkles on top of your fudge. In a microwave safe bowl pour chocolate chips and microwave for 60 seconds. Stir and continue to microwave for 1 minute more, stirring every 15 seconds until smooth. Stir in frosting. The mixture will be thick. Mix well and return to the microwave and heat for an additional 15 seconds and stir well. Place the fudge into a piping bag and pipe into each bunny cavity. This recipe will easily fill 2 pans and you'll probably only have one. So, I'd suggest the following: Put half of the mix into the piping bag and leave the other in the bowl (remove the spoon) and then make the first batch of fudge. Then reheat the bowl and put into a new piping bag and make more. OR you could reheat in the piping bag. It's just hard to knead it when the tip is cut. Or just put the remaining into a 8×8 foil lined square pan and call it good. Place your baking sheet into the freezer for at least 30-60 minutes. We started by refrigerating for 30 minutes, but the bunnies didn't feel firm enough to come out in one piece. So they went back in the freezer for another 30 minutes and that worked. But I'd likely give it even more time, if I had it. When the fudge is set, remove from the pan. 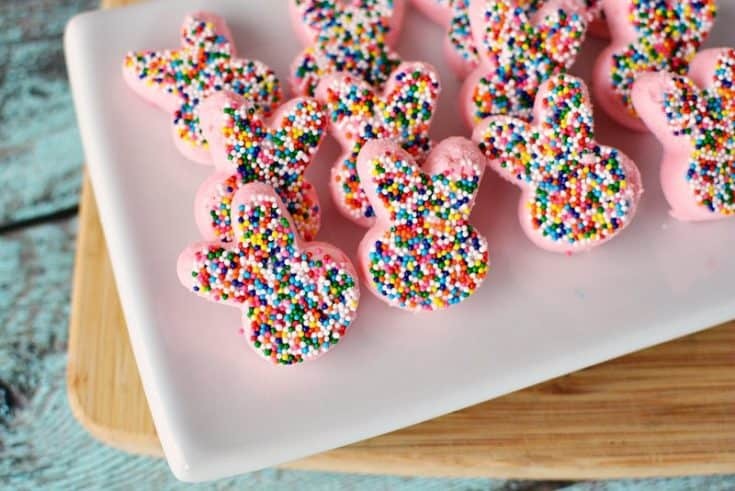 Place the pan face down onto the baking sheet and start by removing the ears first (if your sprinkles are on the bottom). The bunnies will come out of the mold, but you need to remove the ears first and really “turn the mold inside out” to get them out. Try not to put pressure on the fudge but rather to peel the pan away. 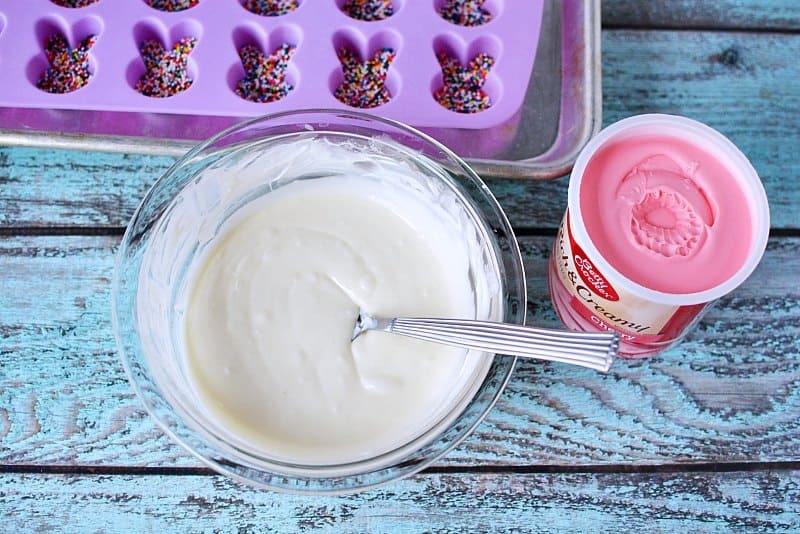 It may be easier to put the fudge into the mold and then sprinkle the sprinkles on top. This way when you pop it out if any of the ears “break off” a bit would be on the bottom of the fudge and you won't see the cracks. In a microwave safe bowl (preferably one bigger than the one I use used) pour chocolate chips and microwave for 60 seconds. Stir and continue to microwave for 1 minute more, stirring every 15 seconds until smooth. Stir in frosting. The mixture will be thick. Mix well and return to the microwave and heat for an additional 15 seconds and stir well. Place into a piping bag and pipe into each bunny cavity. 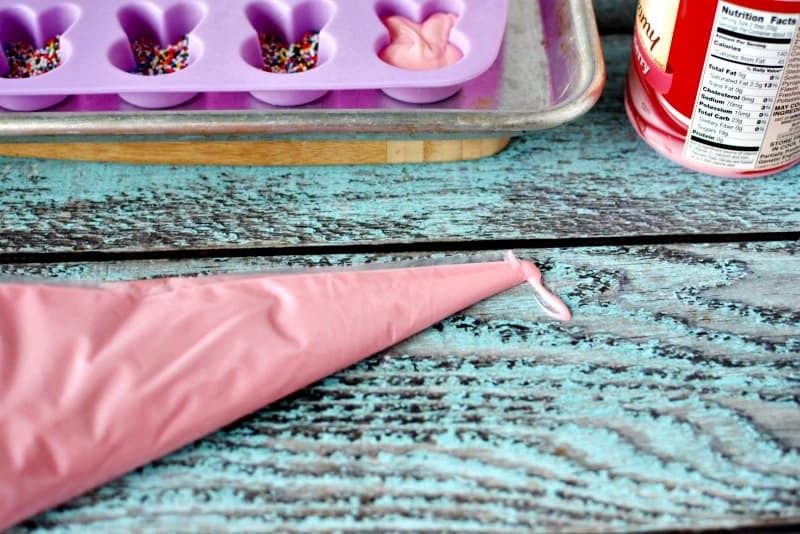 Place your baking sheet into the freezer for at least 30-60 minutes. When fudge is set, remove from the pan. Place the pan face down onto the baking sheet and start by removing the ears first (if your sprinkles are on the bottom).